You still have to water and weed a green roof. New green roofs should be watered until the plants are established, and it is important to weed green roofs several times a year to keep the plants healthy. A green roof is a layer of vegetation planted over a waterproofing system that is installed on top of a flat or slightly–sloped roof. Green roofs are also known as vegetative or eco–roofs. They fall into three main categories—extensive, intensive, and semi–intensive. Although there are no precise definitions of them, an extensive green roof has a shallow growing medium—usually less than six inches—with a modest roof load, limited plant diversity, minimal watering requirements, and is often not accessible. Intensive green roofs have more soil and a deeper growing medium—sometimes several feet—that can support a more diverse plant selection, including small trees. Thus, they have more substantial structural loads and need more frequent maintenance and watering. They are usually accessible. Semi–intensive green roofs include features of both types. The appropriate depth of any green roof depends on the roof structure, the plants chosen, annual rainfall, and stormwater performance requirements. 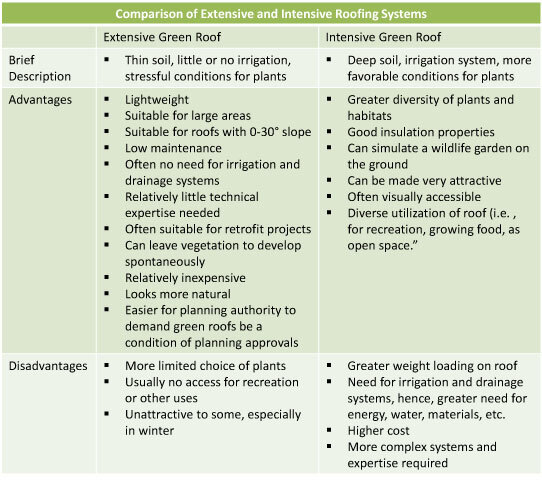 Comparison of extensive and intensive roofing systesms. 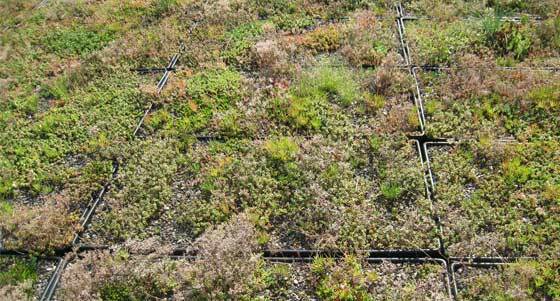 Source: Greenbacks from Green Roofs: Forging a New Industry in Canada. All three types of roofs require specific layers of roofing materials not found on regular roofs. The basic anatomy of a green roof consists of vegetation, growing medium, filter membrane, drainage layer, waterproof/root repellant layer, roofing membrane support for plantings above, thermal insulation, vapor control layer, and structural roof support. Each of these layers performs a specific function to keep the plants alive and to protect the structure beneath. Cross section of green roofing layers. 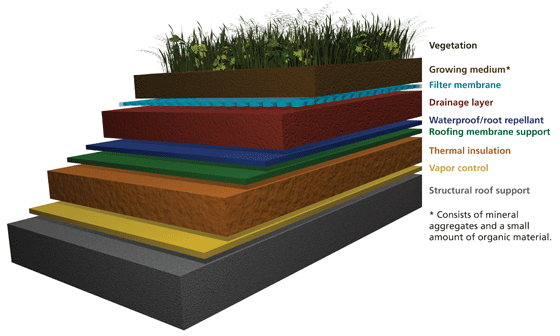 Each of these layers has a specific function and is necessary for the success of the green roof. Illustration: Blank Space LLC. Growing medium is not the same material used for a house plant or a garden. Traditional soil is heavy and packs tight after repeated rains, reducing water retention and aeration for plant roots. Green roof growing medium is composed of mineral aggregates and only a small amount of organic material. It should have good consistent drainage and aeration with a structure that enables it to hold water. It should also be light weight, resistant to decomposition and compression, and physically and chemically stable. Some green roofs are installed in one large integrated section, while modular green roofs use small portable planting beds placed together to create a larger green roof. The modular units are often plastic or metal trays filled with growing medium. Modular green roofs can be installed incrementally and are easily removed for maintenance and inspection of the roof layers underneath. Additionally, the modular sections can often be cultivated in a greenhouse and be ‘ready to plant’ on the green roof. Since the plants are already established, there are fewer issues with replacement plants that do not take root or thrive. One drawback however, is that moisture cannot flow between units, increasing the impacts of wet and dry spells on the plants. Modular trays used to create a larger green roof installation. The trays will become less visible as the plantings mature and grow.